Get a great price on the VooPoo Vmate Mod from Vapor DNA. The VooPoo Vmate comes both as a standalone mod, and as a kit, featuring the Uforce T1 sub-ohm tank. In this review, we’ll be taking a look exclusively at the Vmate 200W mod, but we’ll also be doing a review of the VooPoo Uforce T1 in the very near future. The Vmate mod comes in a fairy bland-looking cardboard box. It features a digital rendition of the mod on the front, but it really doesn’t do it justice at all. It’s an uninspired graphic, and even though I don’t usually care much about packaging, I really think VooPoo could have done a much better job in this case. Anyway, on the back of the box, we have a list of contents, some warnings, a scratch-and-check authenticity sticker, and on one of the sides you can find a sticker showing the color scheme of the mod’s replaceable panels. Inside the box we have just the VooPoo Vmate mod, which comes wrapped in a protective plastic bag, a micro-USB cable for charging and firmware upgrades, a user manual and a warranty card. It’s basically your standard mod kit. 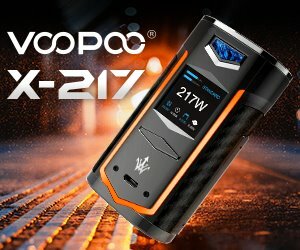 As I mentioned in the introduction, the VooPoo Vmate looks completely different from the Chinese company’s previous vape mods. 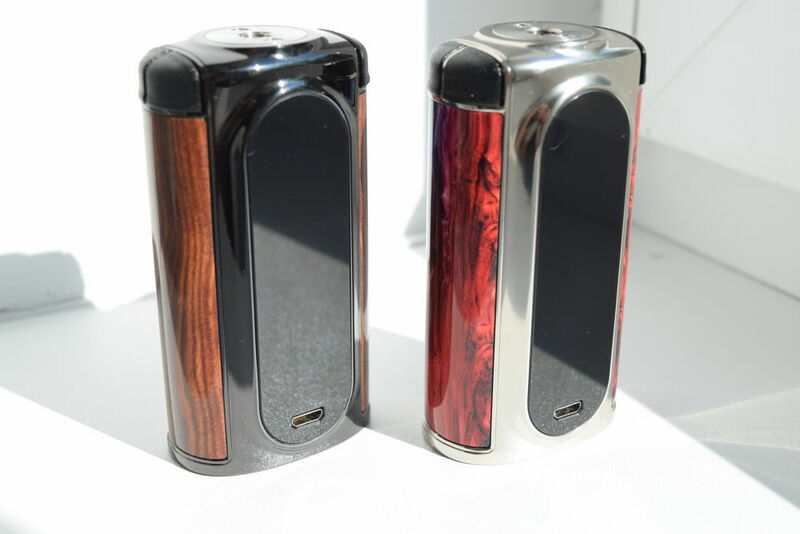 Whereas the VooPoo Drag, Alpha One and VooPoo Too were bulky box-mods, the Vmate is a much slicker and ergonomic device. 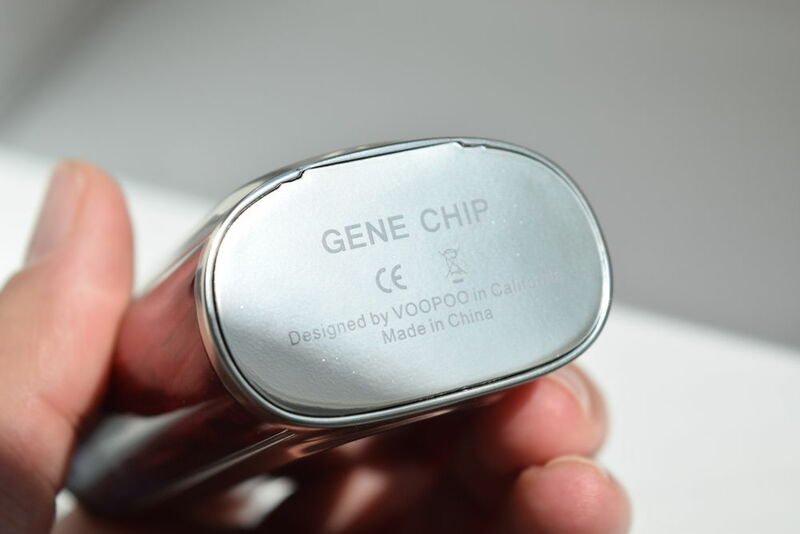 The VooPoo Vmate measures 89mm x 47mm x 30mm and is made primarily of “reinforced zinc alloy”. I will say that at first glance, this really looks like a high-end device, but once you pick it up and really analyze all of its components, you realize it is only an illusion. I’m not saying that the Vmate is poorly-made, just that it feels cheaper than it looks, and for me that was a disappointing discovery. 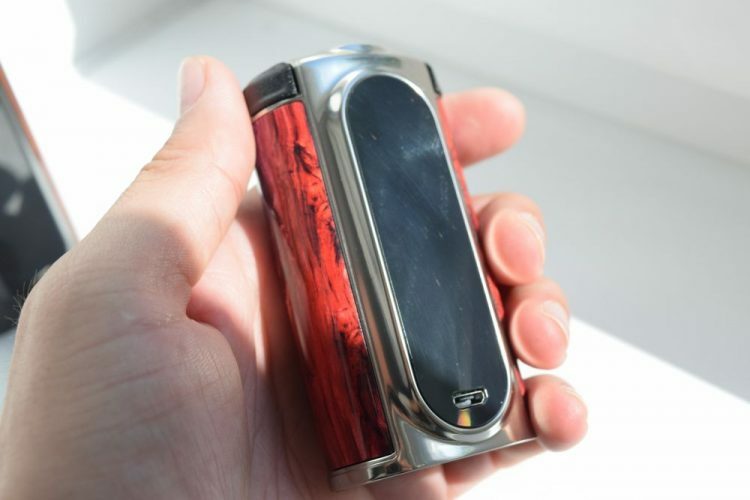 For one thing, this mod feels really light in the hand – too light for my liking – especially without batteries. 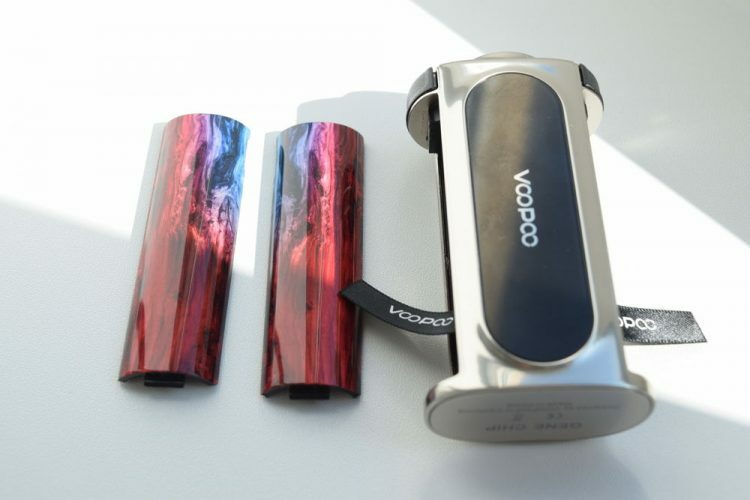 On their official website, VooPoo claims that this was by done intentionally, to make it more comfortable and easier to carry around, but I feel like they overdid it. 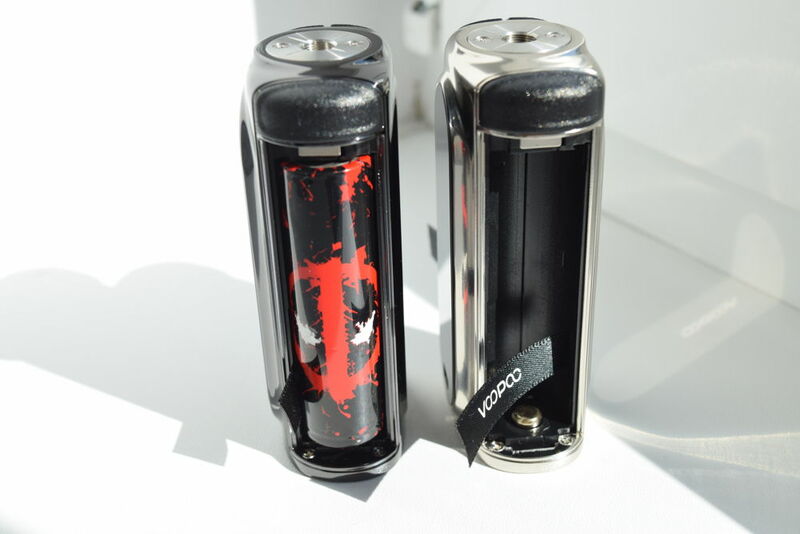 A mod must have some weight to it for a high-quality feel, but at just 100 grams, the Vmate does not. This is definitely a subjective con, so if you like your mods to be light as a feather, simply ignore this paragraph. Starting at the very top, we have centered 510 connection, which would normally qualify as a big pro, but in this case, the connection is slightly raised from the mod, so the fact that the device has a width of 30mm is irrelevant. The connection itself is just 25mm in diameter, so anything over that will overhang. It’s not a big deal, not many atomizers out there have a diameter of over 25mm, but still, making the connection centered only to limit the number of compatible tanks and RDAs doesn’t make much sense to me. Then we have the buttons, which in the case of the VooPoo Vmate have a very awkward placement. They literally take up the upper corners of the mod – a large fire button on one side, and the ‘+’ and ‘-‘ buttons on the other. I’ve been using the Vmate for just over a week, and I still have several gripes with the buttons. Issue number one is the cheap feel of the buttons. They are all made of a cheap plastic, so even though they are clicky and responsive, they look and feel very cheap, so they are in sharp contrast with the device itself. Another big problems I just can’t seem to be getting used to is the fact that both the fire button and the two adjustment buttons have the same exact design, so I often find myself pressing the wrong button if I’m not looking. Yes, the ‘-‘ and ‘+’ buttons are split down the middle, but by the time I feel that with my thumb, I’ve already pressed one of them thinking it was the fire button. So then I have to adjust the power output again. It’s kind of annoying. 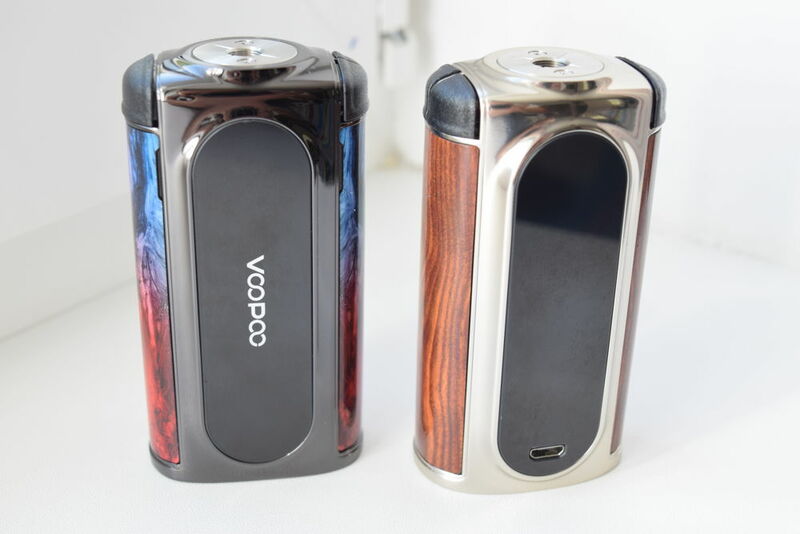 The VooPoo Vmate features two large, oval-shaped panels on its two larger sides. 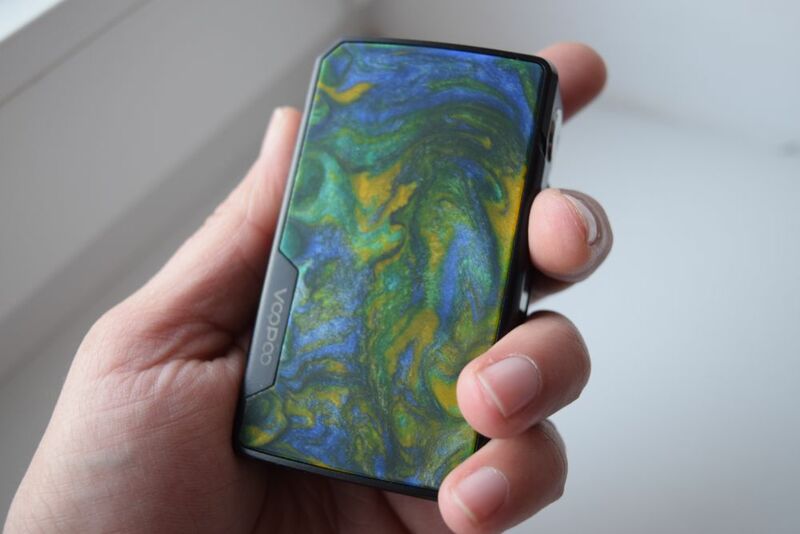 One of them simply says ‘VooPoo’, while the other conceals the display of the mod, We’ve seen this done before, but in this case, I was disappointed to see that the screen only took up about a third of that panel, with the rest being wasted real-estates. And it’s not even that impressive of a display to be honest. It’s bright enough, but it’s black and white and the clarity isn’t something to write about either. 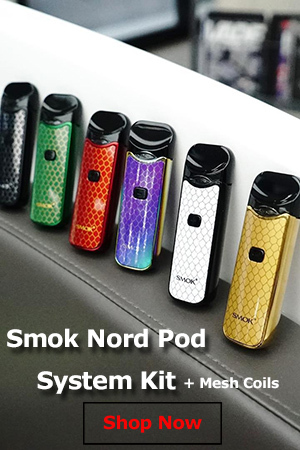 I would have probably not complained about it so much had that oval panel been smaller, but this way I feel like VooPoo just set themselves up for no good reason. 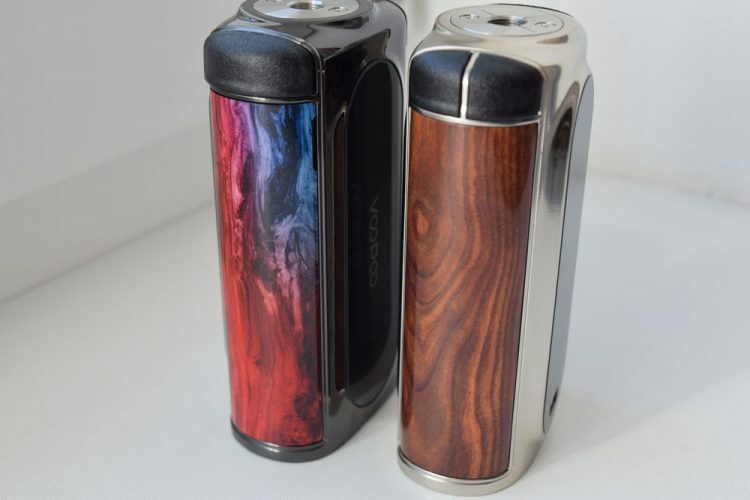 Finally, the main feature of the VooPoo Vmate mod is the design of its battery doors. Yes, not one, but two battery doors, one for each battery compartment. They are located on the narrow sides of the mod and come in a variety if colors and patterns. For this review, I received the stabilized wood and regular wood patterns, but you can find panels that replicate black marble, resin or camouflage. And they are all interchangeable, so if you want, you can just by a new set of panels and use them with your mod. I will not deny that these battery door panels look absolutely gorgeous, in fact they were the first thing that really caught my attention, but like the general look of the Vmate, they are an illusion. Unfortunately, the panels look a lot better than they actually are. They are made of a thin plastic that feels so disappointingly cheap in the hand. When I think about those durable G10 panels on the Modefined Draco and compare them to these flimsy plastic panels… There’s just no comparison. I really thought they were resin the first time I saw the Vmate mod, but I never expected them to be cheap plastic. Then there is the idea of having two separate battery compartments. It’s just not very practical, in my opinion. You remove one battery door, place or replace a battery, then put the battery door back on, and then instead of using the mod, you have to do the exact same thing on the other side. Plus, the two panels, are not interchangeable, so if you feel like one of the door doesn’t seem to fit on one side, it’s because it actually belongs on the other side. I’ve personally had no issues with the magnets on the inside of the panels, but I’ve read at least two reports of people complaining that they come off the mod, and judging by how cheap the panels feel, I tend to believe it. Luckily, it’s nothing a bit of superglue can’t fix, but still, the fact that thus is an issue says a lot about the overall quality of the mod. 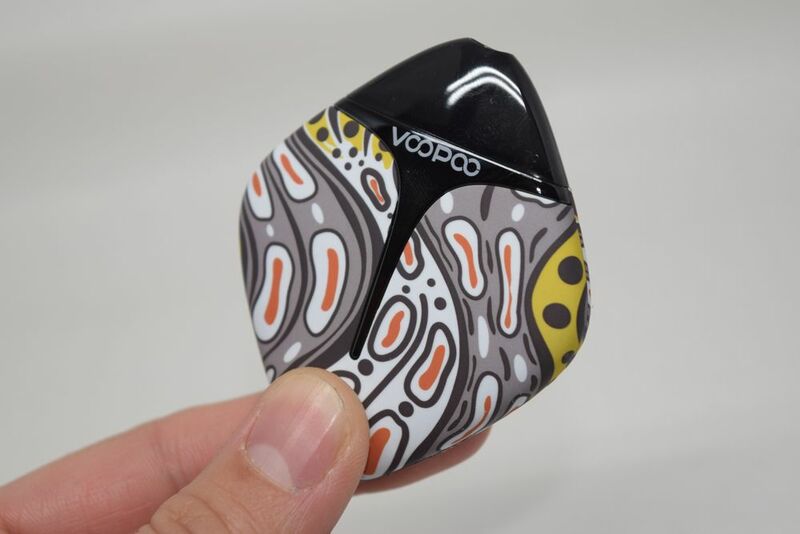 That’s about all there is to say about the VooPoo Vmate, a mod with an extremely attractive design that just doesn’t deliver in terms of quality. The device itself just feels too light, the buttons are made of cheap plastic and have an awkward placement, and the battery panels, while ingenious, are not very practical and feel as cheap as the buttons. This probably sounds a lot worse than it actually is, but it’s just that the Vmate just seems like such a wasted opportunity. They could have done a much better job is all I am saying. 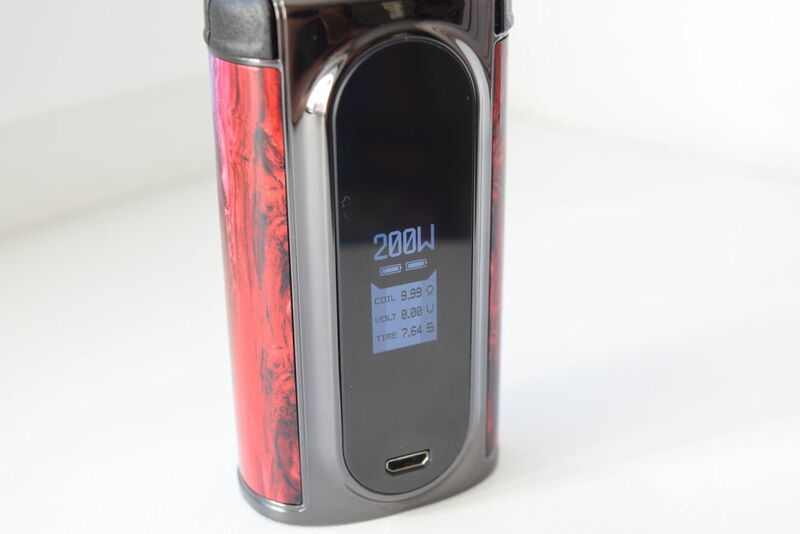 The VooPoo Vmate has a very simple menu system, one that some vapers would go as far as calling rudimentary. 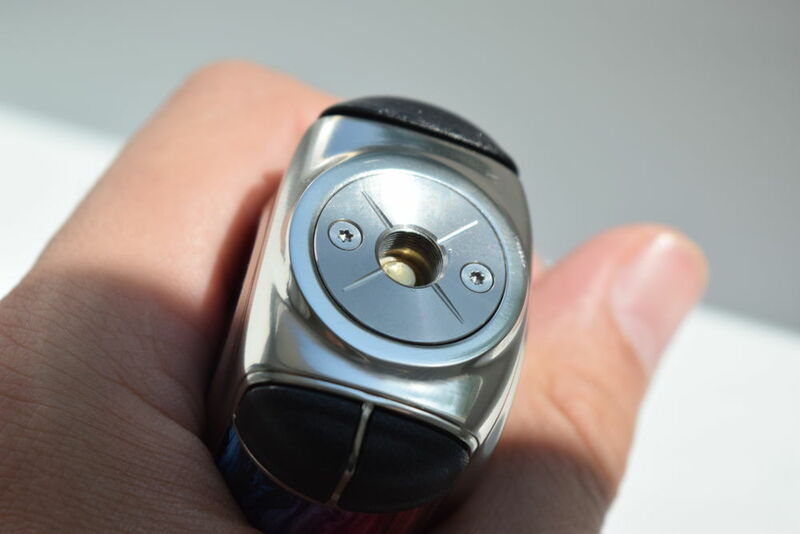 You basically have two operating modes – wattage mode and temperature control for three supported materials (nickel, titanium, stainless steel) – which you can toggle by pressing the fire button three times in rapid succession. Then there is a secondary menu you can access by keeping the ‘-‘ and ‘+’ buttons pressed simultaneously for two seconds. The options displayed here depend on what mode you are in when accessing it. In wattage mode, you have memory mode for wattage, an option to lock the buttons of your mod, one to check the ID of the Gene Chip inside the device, and finally an option to check the version of the installed firmware. When accessed in temp. control mode, the secondary menu also has memory mode for temp. control, as well as an option to lock the resistance of the atomizer and set the TCR. Having to go into the secondary menu to lock the buttons of the VooPoo Vmate mod would have been redundant, but luckily you can also do it by pressing the fire button and the ‘+’ button simultaneously. That’s pretty much all there is to the menu of the Vmate. As you can see, it’s not the most feature-rich menu ever made, but that may actually be a plus for people who like simplicity, so I’m not going to fault VooPoo for it. I would have liked to see the custom power curves mode finally implemented, though. 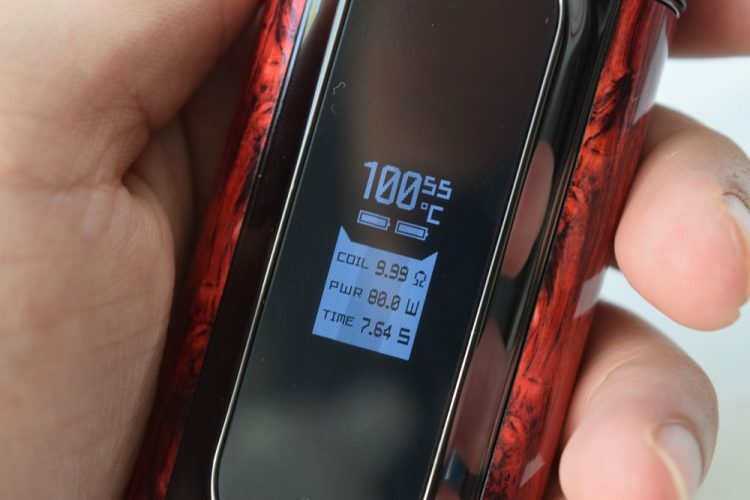 The Vmate mod is powered by an updated version of the same Gene Chip that put VooPoo on the map when the Chinese company launched the Drag 157W, last year. It is considered one of the best chips in the vaping industry, with some comparing its performance to that of DNA or YiHi boards, even though it’s several times cheaper. Battery efficiency is something the Gene Chip is known for, so you can expect to get the most out of your batteries when using the VooPoo Vmate. That said, I would have loved for this device to be compatible with other battery types, like 20700, if not 21700. It may have turned out slightly bulkier, but for most vapers the extra battery life would have been worth it. The Vmate mod features fast charging and on-board charging, but, as always, it’s recommended you use an external battery charger when possible. In terms of performance, again, we are talking about a Gene Chip-powered device, so you can expect super-fast firing, impressive power-ramp-up, as well as accurate power output. I’m not an expert at technical stuff, but having used both the VooPoo Drag and the Alpha One, I can tell you that the Vmate is just as impressive when it comes to performance. I haven’t used the mod in temperature control mode, so I can’t comment on that at all. VooPoo makes some of the most well-performing vape mods money can buy, and the Vmate is no exception, but, unfortunately, this time the build quality just isn’t up to par. In my opinion, this is by far the best-looking device the Chinese manufacturer has ever created, but looks can’t save it. The buttons are made of cheap plastic positioned awkwardly, the battery panels are flimsy and impractical and the screen is outdated. Maybe you have an earlier version than I do as power curves have been implemented on my device. They are accessible through the memory slots.